Background: The multiple-choice question (MCQ) has been shown to measure the same constructs as the short-answer question (SAQ), yet the use of the latter persists. The study aims to evaluate whether assessment using the MCQ alone provides the same outcomes as testing with the SAQ. Methods: A prospective study design was used. A total of 276 medical students participated in a mock examination consisting of forty MCQs paired to forty SAQs, each pair matched in cognitive skill level and content. Each SAQ was marked by three independent markers. The impact of item-writing flaws (IWFs) on examination outcome was also evaluated. Results: The intraclass correlation coefficient (ICC) was 0.75 for the year IV examinations and 0.68 for the year V examinations. MCQs were more prone to IWFs than SAQs, but the effect when present in the latter was greater. Removal of questions containing IWFs from the year V SAQ allowed 39% of students who would otherwise have failed to pass. Discussion: The MCQ can test higher order skills as effectively as the SAQ and can be used as a single format in written assessment provided quality items testing higher order cognitive skills are used. IWFs can have a critical role in determining pass/fail results. Background: Conducting grading of systematic reviews in master's level programs of health sciences education is a complex process. Students conduct systematic reviews under the supervision of course faculty in seminar groups where both draft version and definite version of the literature review are graded/assessed. The aim of this study was to develop a systematic review of the literature rubric (SRL-rubric) for the evaluation of systematic reviews in the course of SRL in a master's Program of Health Care Sciences and to investigate students and faculty experiences with and the usability of the SRL-rubric. Methods: The SRL-rubric was developed using a seven-step approach. Usability was investigated with cross-sectional survey. Results: The SRL-rubric included nine categories and five proficiency levels. Fifty-two of 59 students and all six faculty members at Utrecht University Program of Health Care Sciences completed the survey. Students rated the ease of working with the rubric with an average 6.6 (10-point scale). Faculty ratings ranged from 7 to 9. Problems were identified with distinction among cells describing proficiency levels and final grading. Discussion: A structured process focused on the requisite actions to develop the SRL-rubric. It was useful in writing and grading systematic reviews. However, some students indicated that they missed specific feedback and suggestions describing how to improve their weaknesses. Further development and research is needed to enhance grading reliability of SLR-rubric and to establish content validity and maintain consistency with criteria for conducting and reporting reviews. Background: Learning approaches have been proposed to affect the experience of psychological stress among tertiary students in recent years. This relationship becomes important in stressful environments such as medical schools. However, the relationship between stress and learning approaches is not well understood, and often studies done cannot be generalized due to different sociocultural differences. In particular, no study in Malaysia has looked at learning approaches among medical students. Aims: To address this gap, we examined the relationship between perceived stress and learning approaches by considering sources of stress. Methodology: The Perceived Stress Scale (PSS-10), Medical Student Stressor Questionnaire, and the Revised Two-Factor Study Process Questionnaire were answered by the preclinical and final-year students studying MBBS in a Malaysian campus of British University. Results: Deep learning was positively and surface learning negatively associated with perception of coping with stress. In this study, neither approaches were associated with psychological stress as opposed to previous reports. We found surface learners to report higher level of stress associated with social stressors. We found students' self-perception of feeling incompetent and feeling they need to do well to be significant sources of stress. Discussion: Deep learning promotes psychological resilience. This is of paramount importance in learning environments where stress is highly prevalent such as medical school. Promotion of deep learning among medical students is required at earlier stages as they tend to solidify their approach through their university years and carry that approach beyond school into their workplace. Background: The Team Strategies and Tools to Enhance Performance and Patient Safety (TeamSTEPPS®) program provides a situation-monitoring tool that allows health-care professionals to perform an environmental scan. This process includes scanning the status of the patient, team members, and the environment, to ensure that patient care is progressing toward the goal. It is assumed that health-care professionals will act in a certain way by providing feedback and support based on the scan. However, there is limited research supporting the impact of the clinical environment on behavior among health-care professionals. Methods: This qualitative research used in situ simulation and a theoretical sampling of six day and overnight shift clinical teams (n = 34) from three departments in an urban hospital in New York City: pediatric medicine, emergency medicine, and internal medicine. Notebook entries by the participants at three intervals during the case and a debriefing following the cases captured participant views, observations, and concerns about the immediate clinical environment. Results: In all six cases, and with every shift, there were documented examples of someone in the environment who saw something but did not speak up, possibly making a difference in regard to patient safety and the outcomes in the case. Some of the noted reasons include not wanting to be wrong, not wanting to hurt someone's feelings, or not being sure. Discussion: Our research explored the environmental scan that health-care team members conducted in three unique department settings, including how they perceived affordances, and the reasons why individuals may not speak up when another team member is not performing properly. Each person possesses a unique awareness and deficit of available affordances because of his/her position in the environment. Patient safety is somewhat reliant on the views and observations of each team member. Educators should use these outcomes to justify teamwork and communication training that includes targeted emphasis on providing candid feedback, situation monitoring, and mutual support. Background: Medical colleges invest considerable effort in developing assessment programs to effectively evaluate students across attributes of knowledge, skills, and behavior. While assessment by direct observation is designed to be objective, “soft characteristics” such as personality, demeanor of student, and assessor may make assessment more subjective. The effect of such attributes in medical education remains unclear and needs exploration. The objective of this study was to explore non-cognitive traits of assessor and learner to understand their roles in student assessment. Methods: A mixed-method study was conducted during March to June 2015. All clinical faculty members at the Aga Khan University were invited to participate in this study. A questionnaire was designed and completed by the study participants. Two focus group discussions (FGDs) with faculty members explored teacher and learner traits influencing student assessment. A documentary analysis of the yearly student feedback report with a focus on the section on assessment was also utilized. 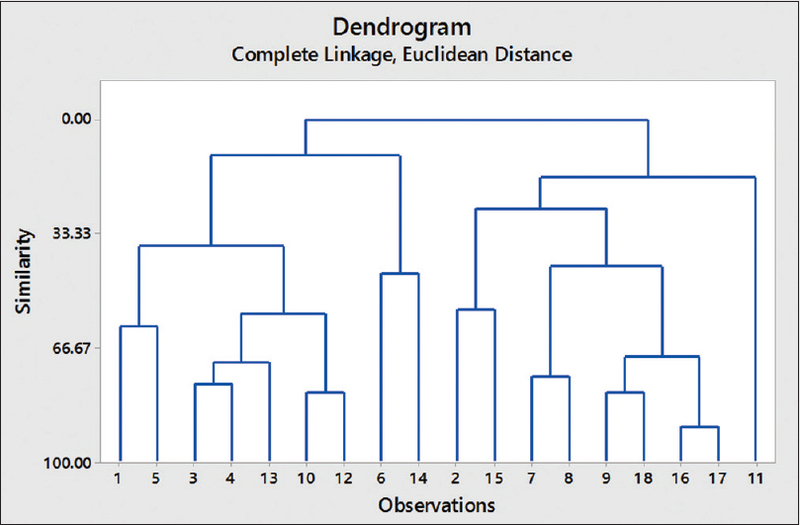 Data triangulation was achieved by combining three sets of data. Results: Fifty-four (28%) clinical faculty members completed the questionnaire and 11 participated in the FGDs. 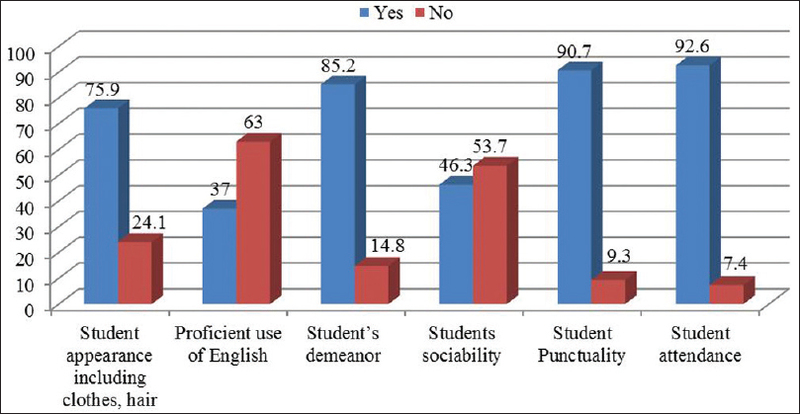 About 68% reported rating students leniently. More than 50% reported their personality as a factor influencing assessment and 76% reported student appearance influencing assessment. The documentary analysis identified faculty personality and rating styles as key issues affecting the validity of student assessment during ongoing observation. In the FGDs, traits such as eagerness, intuition in students, and body language were reported to influence faculty members during the assessment. Discussion: Softer attributes of trainer and trainee increase the subjectivity of student assessment. Ongoing faculty training and rater feedback are required for a robust and objective assessment. Background: Several predictors of medical school performance have been identified, yet more research is needed to select applicants who will perform well. Grit is a personality trait that is described as persevering through difficult tasks. Although it is hypothesized that this type of trait would be high in a medical student population, this has not been studied. The purpose of this study was to examine grit among medical students and to explore whether grit-predicted performance in medical school. Methods: There were 131 graduating medical students who completed a questionnaire in May 2014 on grit as well as demographic questions and involvement in other activities in medical school. Data on test scores, years in medical school, and class ranking were obtained from the medical school. Results: The average grit score among 130 medical students was high (mean = 4.01, standard deviation = 0.42). Those who completed the program in 4 years had higher grit scores than those who completed in 5 years (P = 0.01). Grit was related to medical school performance including clinical knowledge scores (P = 0.02). There was also a difference between the highest and lowest class rank (P = 0.03). Discussion: Medical students have high levels of trait-like perseverance and it appears that those with higher levels of grit are more likely to perform better in medical school. Background: Rural doctor shortage is a problem in many countries. Factors associated with doctor retention were reported such as colleagues, workload, accommodations, transportation, proximity of family and friends, incentives and career path. Rural background recruitment, increasing the quantity of doctor production to supply in rural and remote areas, and regulation are claimed to alleviate doctor scarcity in rural communities. Many programs have been developed, but an imbalance in physician distribution persists. Community-based learning (CBL) is recommended by the WHO to promote doctor retention. The longer contact time of CBL is practical, but it is uncertain that this results in greater retention. The objective of this study is to determine the association between contact time of CBL and retention of doctor with rural background recruitment. Methods: A cohort study was performed. The study population was 10,018 doctors graduated during 2001–2010 and followed up at least to 2014. Of the 10,018 physicians, 2098 doctors (21%) were recruited from rural backgrounds by the Collaborative Project to Increase Production of Rural Doctor (CPIRD). Contact time of CBL was calculated to the proportion of total curricular credit hours. The primary outcome was retention rate in government health-care system over 4 years. Statistical analysis was performed using multiple logistic regression. Results: A total of 5774 doctors (57.6%) were retained in the government health-care system. 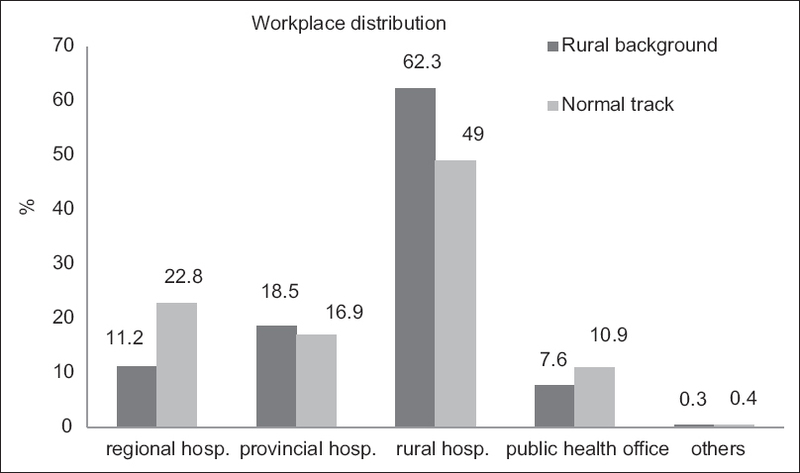 Higher percentages of CPIRD doctors were retained than normal track (72.1% and 53.8%, P < 0.001), especially in rural hospitals (60.3% and 38.4%, P < 0.001). Based on univariate analysis, CBL was slightly higher in retention than resignation group with statistical significance (2.97% and 2.90%, P = 0.045). Multiple logistic regression results showed that CBL, graduate entry, and geographic location of workplace were significantly associated with retention. Discussion: CBL can enhance doctor retention. It should incorporate meaningful experience such as rural exposure together with classroom teaching to focus concepts and integrating service to the community. Graduate entry and geographic location of workplace also have an impact on decision-making regarding retention. Background: Hybrid simulation training (HST) is a teaching modality that combines patient interaction using simulated patient (SP) with pelvic model. This provides realism to learners, lacking in manikins alone. This study was designed to compare knowledge, procedural, and communication skills of medical students regarding intrauterine contraceptive device (IUCD) insertion before and after introducing HST and to assess learner satisfaction with this methodology. Methods: This quasi-experimental mixed-method study was conducted at Aga Khan University Hospital, Karachi, from October 2016 to September 2017, for third-year medical students (n = 90). IUCD insertion was introduced to students through interactive session and provision of literature/video clip on IUCD insertion. Students were pretested on objectively structured clinical examination -station (IUCD insertion) using SP and manikin simultaneously. This was followed by practice on manikin and subsequent posttest on same OSCE-station. Learner evaluation of activity was through validated pro forma with both, Likert scale and open-ended questions. Results: Out of the 90 students, 73 completed pre/posttest and evaluation survey. There was significant increase in pre- and post-simulation mean scores for all clinical skills; history taking (5.1 pretest, 8.8 posttest, P ≤ 0.0005), counseling (40.11 pretest, 57.85 posttest, P ≤ 0.0005), procedural (15.16 pretest, 49.09 posttest, P ≤ 0.0005) and total scores (60 pretest, 115.6 posttest, P ≤ 0.0005), when compared using two-sided Wilcoxon signed rank sum test. Overall, activity was assessed as “very good” to “excellent” by 83.5% participants. Themes generated from open-ended questions of evaluation forms were “Process-descriptors,” “Teaching-utility,” “Pedagogic-efficacy” and “Way-forward.” Discussion: HST is an effective teaching strategy with potential to improve competency of medical students. Students acknowledged it, as innovative learning strategy that increased their satisfaction and confidence in performing IUCD insertion. Background: Graphic narratives can give medical and nursing students a broader concept of health and illness. However, graphic texts are not yet integrated into medical education in India. The present study was undertaken to assess the perception of medical and nursing undergraduate students about the use of comics in health professions' education. Methods: This study was an institution-based cross-sectional study conducted among 130 medical and 108 nursing students of a medical and nursing college, respectively, in Central Delhi. 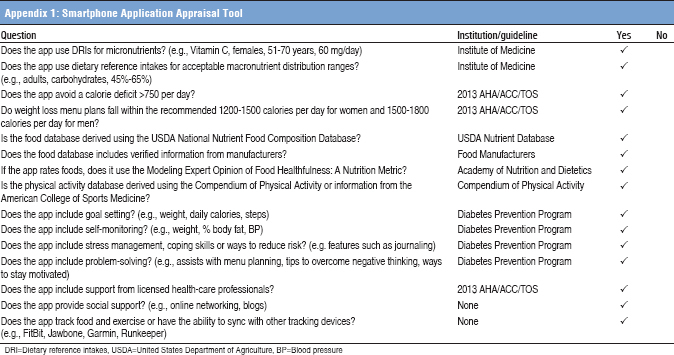 A pretested self-administered questionnaire containing items to assess knowledge and perception about graphic medicine in medical education was used for data collection. Data were analyzed using SPSS 16.0. Results: The mean age of students was 20.82 ± 1.51 years. Out of the 238 students, only 21.8% had heard about graphic medicine. However, 76.9% (n = 183) of students agreed that comics should be used in health professions' education. When asked about the subjects in which comic strips can be useful, the majority of medical students wanted them to be used in teaching community medicine (n = 95; 73.1%), while nursing students more often indicated their use in anatomy (n = 59; 54.6%). Overall large proportion of both nursing and medical students opined that comics aid in better understanding (58.8%) and memorization of concepts and content (57.6%). The majority of respondents felt that comic designing requires expertise (67.6%). Students also stated that comic strips on communicable diseases and reproductive and child health could be developed and used in teaching the subject of community medicine/public health. Discussion: Majority of students felt that comics should be used in medical education in India, preferably for teaching community medicine. Further, maternal and child health are important topics that can be taught using comics in public health. There is a need to explore ways for integrating graphic medicine into health professions' education. Background: Medical educators provide service by developing curricula and writing learning material. In addition, academic institutions expect medical educators to publish scholarship to be considered for promotion and academic advancement. Unfortunately, educators may receive limited time to execute these duties and expectations. One way medical educators can streamline their workload is by publishing educational coursework they have previously written into an e-book through an online publisher. This allows them to transform educational service they have already completed into scholarship required for academic recognition, thus maximizing the efficient use of their time. Intervention: Publishing educational material as an e-book requires four steps. First, medical educators must determine which of their educational materials is best suited for publishing as an e-book. Second, educators must rank the features of each e-book publisher and choose the one that best meets their needs. Third, the educational material must be adapted as a manuscript and submitted for publication. Finally, the e-book must be advertised, promoted, and distributed to its intended audience. In addition, the success of the project should be evaluated. To illustrate this process, we describe the steps we took to publish the learning material we created for our internal medicine residents into an e-book. Lessons Learned: The overall process took approximately 3 months and went smoothly. For future publications, we would determine better ways to track the number of downloads of the e-book, ensure all of our images are adequately large, and consider the use of academic, rather than commercial e-book publishers.